I love being a member of Influenster. I love being a part of the community and being able to share my thoughts on products that I've tried. Through the VoxBoxes, I've also been introduced to many new products that I might not have tried on my own. 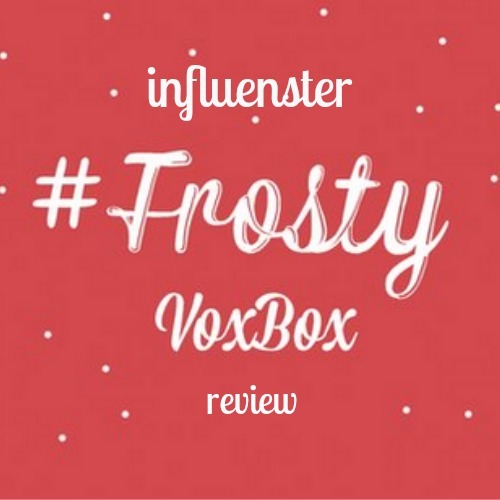 When I got an email that I was going to get a Frosty VoxBox, I was so excited. I had been seeing people post on Twitter about it, and seeing all the cool products that were included in the VoxBox. It seemed like a really good variety, and all stuff that I would like to use. When I got it, it did not disappoint. The day the box arrived, Dave and I ate the entire bag of Fruit Vines Bites that were sent. I received cherry flavored bites in my box, and I think Dave liked them a little better than I did, because they were a little tart. They are a nice, bite sized candy, and definitely softer than Twizzlers bite sized candies. I did like these, but if I were to buy them again I might try them in another flavor (they also come in strawberry!). One of my favorite things that was really the most "winter" themed in this box was the Celestial Seasonings Candy Cane Lane Decaf Green Tea. 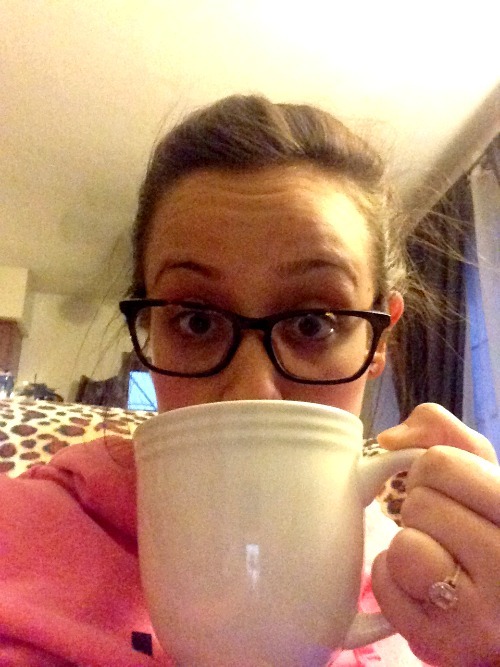 As much as I love coffee, I have been trying to drink more tea, especially at night. Sometimes the caffeine in coffee is just too much for me. 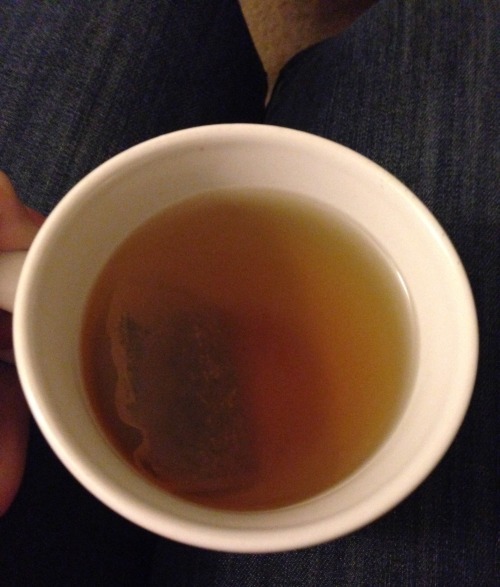 This decaf green tea was perfect, because it had a subtle mint flavor. It wasn't overwhelmingly sweet or too pepperminty tasting at all. This was definitely something that I could drink on a nightly basis for that evening cup of tea. McCormick Gourmet All Natural Thyme has made a great addition to many of our recipes. This is a full size sample of Thyme, and we recently put some in a batch of homemade chicken noodle soup. It took what could have been a very basic meal up a couple of notches to some very tasty soup. One of the things that I was most excited for was the EcoTools Styler + Smoother hairbrush. I've heard really good things about the EcoTools line, and I was dying to get my hands on one of these brushes. I've used this brush for a couple of weeks now, and I have to say... it's honestly not worth the hype. I do like it, and I like to use it to blow dry my hair, because with how the brush is designed it seems to dry faster. But I've read a lot of the reviews on influenster about the styler + smoother brush, and people claim that it is "fixing their hair from damage." I mean, I like this brush, and it is nice, but it's not fixing my hair from damage. It does seem to pull out less of my hair when I brush it wet, so that is good. Maybe I'm using it wrong? Does anyone have tips? The Boots No7 Protect & Perfect Intense ADVANCEDsample was another one that I was on the fence about. I enjoyed using it, but the sample was only enough for about 2 uses. The serum was very silky, and didn't make my skin feel greasy at all. It did have a little bit of an odd smell though. However, you are supposed to see results with this product after 2 weeks. I feel that while I liked to use it, I can't give an accurate opinion of how it works, because I didn't use it for long enough. My favorite products included in the Frosty VoxBox were the Rimmel Products. Influenster and Rimmel always bring me the best products to try out. I always end up liking them, and usually incorporate them into my makeup routine. 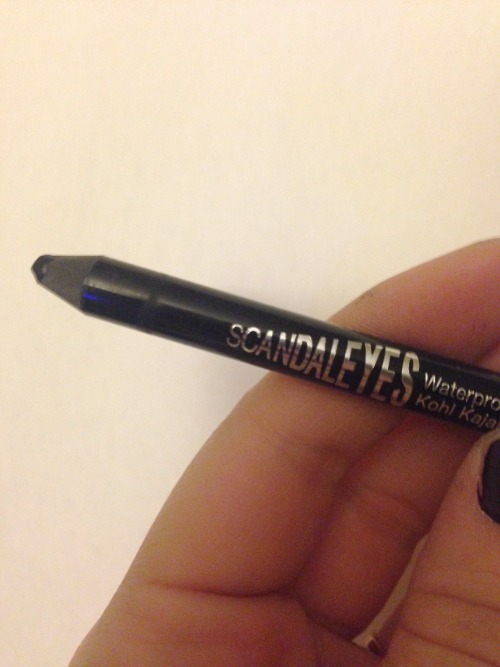 This Rimmel Scandaleyes Waterproof Kohl Kajal Eyeliner came at the perfect time. I recently ran out of the Stila liquid eyeliner pen that I had been using, and bought one from CoverGirl that just wasn't cutting it. This kohl eyeliner pencil is very soft, so it goes on smooth. I usually like to use a liquid liner on the top of my eyes, but I've found that if I can smudge some of this on top and then cover it with a little bit of champagne colored shadow, it has a nice effect. 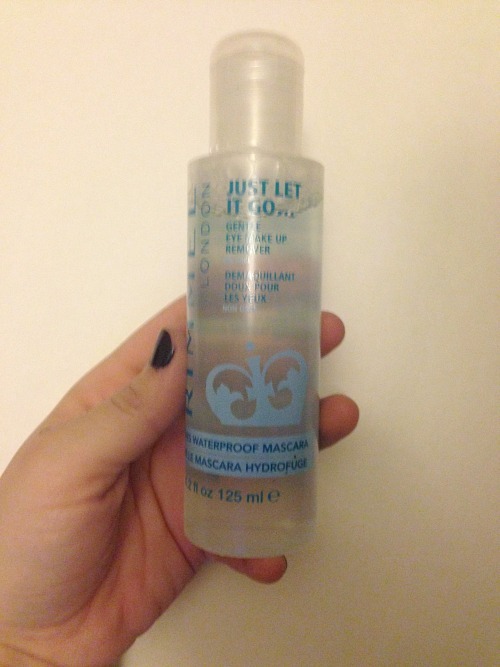 I also really appreciate the fact that it is waterproof, because sometimes on those cold, windy days I get some teary eyes (and who really wants to have to re-apply your makeup because of the cold? Not me). So far I've been using this every day since I got it, and I'm loving it. To go along with my new eye makeup, Influenster sent along the Rimmel Gentle Eye Makeup Remover. I have to admit, I am not always on top of taking off my makeup at night before I go to sleep. Sometimes when I leave makeup on overnight (especially eye makeup), my skin gets irritated, and I end up having to do damage control. I was glad that this came in this VoxBox, so that I could try something that would be gentle on my skin to remove makeup. So far it has worked great, and the skin around my eyes looks very healthy. I definitely notice that when I take the extra step to take my makeup off at night, and then moisturize (I use Josie Maran Argan Oil Light), my skin looks much better, and even holds makeup better the next day. The last item that I received in the Frosty VoxBox, which ended up being a total surprise, was NYC New York Color Expert Last Lip Color in the color Sugar Plum. This lipstick is a wonderful every day color, and I wear it a lot to work. It gives you the right amount of color without looking too bright or distracting. The formula is very smooth and doesn't cake or feather at all. I have to admit that I was a little bit bias about NYC products, because I thought they wouldn't be very high quality, but this lipstick is of much better quality than other drugstore lipsticks that I've used in the past. I would definitely purchase another NYC brand lip product. I love vox box! ESPECIALLY if it includes makeup! Me too! I have so much Rimmel stuff from them and I love it!! This box sounds pretty awesome! I've never heard of Influenster before, they seem great! I love it! They've introduced me to so many good products! If you want, I can send you my referral code, and you can sign up (it's totally free), to start getting your free boxes. Just let me know!